Finally, as we near the end of the cruise, I’m ready to write about one of the major parts of the survey we are doing. Until now, I’ve been trying to take it all in and learn about the science behind our surveys and observe the variety of organisms that we have been catching. In my last few entries, I explained the bongo net tow that we do at each station. Immediately after we finish pulling in the bongo nets and preparing the samples, the boat repositions on the station and we begin a tow using an anchovy net. It gets its name from the size of fish it is intended to capture, but it is not limited to catching anchovies and as you will see in the entry below, we catch much more than fish. Why are we collecting juvenile pollock? We are interested in measuring the abundance of juvenile pollock off of East Kodiak Island and in the Semidi Bank vicinity. We are not only focusing on the walleye pollock, we are also interested in the community structure and biomass of organisms that live with the pollock. Other species that we are measuring include: capelin, eulachon, Pacific cod, arrowtooth flounder, sablefish, and rockfish. As I described in the bongo entries, we catch zooplankton because those are prey for the juvenile pollock. 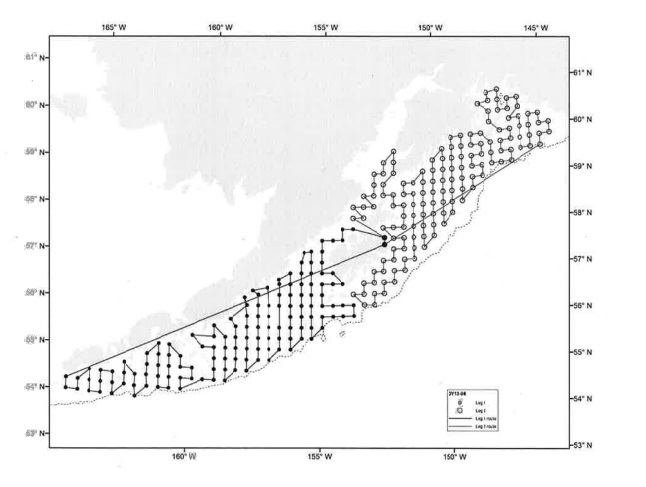 The Gulf of Alaska juvenile walleye pollock study used to be conducted every year, using the same survey grid. Now the Gulf of Alaska survey is conducted every other year with the Bering Sea surveyed in alternating years. That way, scientists can understand how abundant the fish are and where they are located within the grid or study area. With the data being collected every year (or every other year), scientists can establish a time series and are able to track changes in the population from year to year. The number of age 0 pollock that survive the winter ( to become age 1) are a good indicator of how many fish will be available for commercial fisheries. 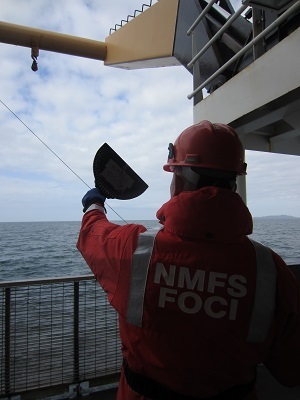 NOAA’s National Marine Fisheries Service (NMFS) will provide this data to the fisheries industry so that fishermen can predict how many fish will be available in years to come. The abundance of age one pollock is a good estimate of fish that will survive and be available to be caught by fishermen later, when they reach age 3 and beyond, and can be legally fished. The other part of our study concerns how the community as a whole responds to changes in the ecosystem (from climate, fishing, etc.). That is why we also measure and record the zooplankton, jellyfish, shrimp, squids, and other fish that we catch. The anchovy net (this particular design is also called a Stauffer trawl) is pretty small compared to those that are used by commercial fishermen. The mesh is 5 millimeters compared to the 500 micrometer mesh that we used for the bongo. 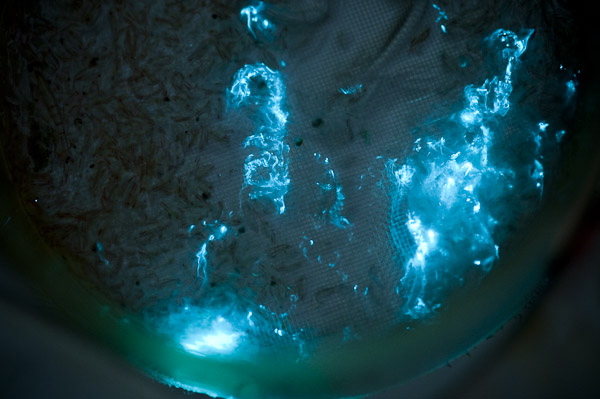 The smallest organisms we get in the anchovy net are typically krill. A picture of a generic trawling net. It’s very similar to the anchovy net that we are using. Typically, we don’t catch large fish in the net, but there have been some exceptions. You might wonder why larger fish do not get caught in the net. It’s because the mesh is smaller and it’s towed through the water very slowly. Fish have a lateral line system where they can feel a change in pressure in the water. The bow wave from the boat creates a large pressure differential that the fish can detect. Larger fish are usually fast enough to avoid the net as it moves through the water, but small fish can’t get out of the way in time. One night we caught several Pacific Ocean Perch, which are larger fish, but very slow moving. They are equipped with large spines on their fins and are better adapted to hunkering down and defending themselves as opposed to other fish that are fast swimmers and great at maneuvering. This is one of the Pacific Ocean Perch (rockfish) that got caught in our net. When we pull in the trawl net, it is emptied into buckets and then the haul is sorted by species and age class. The catch is then measured, weighed, and recorded on a data sheet. After that, we return most of the fish to the sea and save 25 of the juvenile pollock, capelin, and eulachon to take back to Seattle for further investigation. We also save some of the smaller flatfish and sablefish to send back to Seattle. Check out the gallery below to see the process from beginning to end. Where are the pollock in the food web? Eulachon and capelin are zooplanktivores and compete with the juvenile pollock for food. 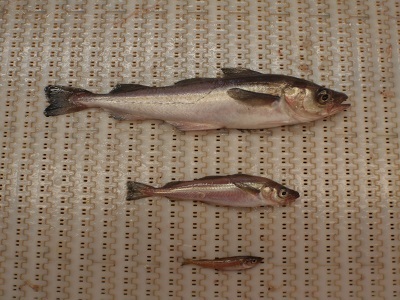 Larger eulachon and capelin are not competitors (those over 150 mm). Arrowtooth flounder and Pacific Cod are predators of the juvenile walleye pollock. Cyanea and Chrysaora jellyfish are also zooplanktivores and could potentially compete with juvenile walleye pollock, so that is why we focus on these particular jellyfish in our study. This Cyanea jelly weighed 11.6 kilograms! One of the most common jellies that we see, Cyanea or Lion’s Mane Jelly. When we pull in the trawl, we sort it into piles of different species and different age classes. If we get a lot of juvenile pollock (age 0), we measure and weigh 100 and freeze 25 to take back to the lab so their stomach contents can be examined. We do the same procedure for young capelin, eulachon, and flatfish. Other organisms like jellyfish are counted and weighed and put back in the ocean. 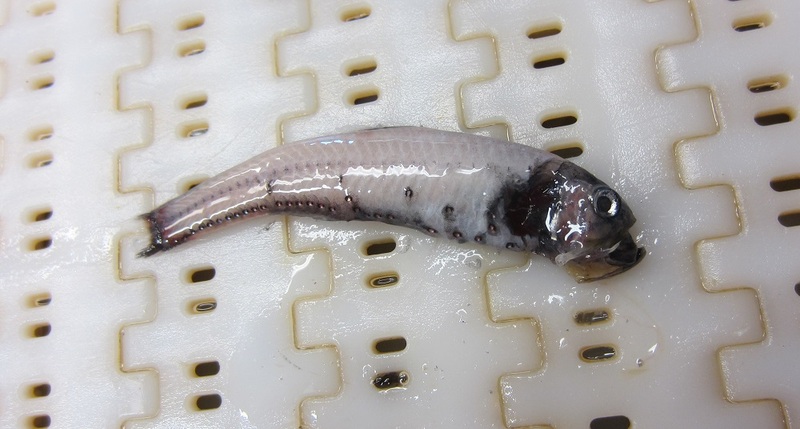 Every once in a while we find Pacific Cod juveniles, which look very similar to juvenile pollock. Sometimes all we catch in the net are jellies! The top two arrowhead flounders are facing up and the bottom one is upside down. Notice the color variation. In flounders, both of the eyes have migrated to the top of the head. 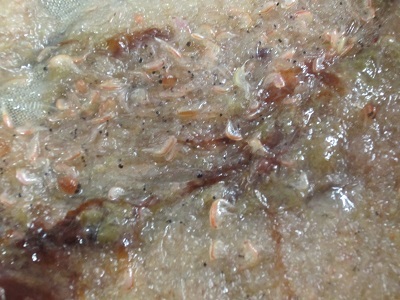 A small pile of krill that was in our anchovy net. 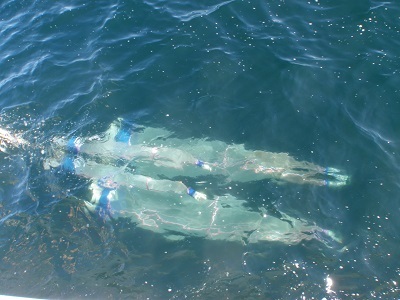 Sometimes we net jellies and sometimes we net kelp, but we are really looking for pollock! These are the larval stage of a fish belonging to the family Osmeridae. They are likely Capelin or Eulachon. Here I am holding a large arrowtooth flounder that was in our trawl. The top fish is a Eulachon, the next is a Capelin, followed by a larval osmerid (could be a Capelin) and lastly, an age zero pollock. As we wind down the cruise, I’m feeling a little sad that it’s ending. 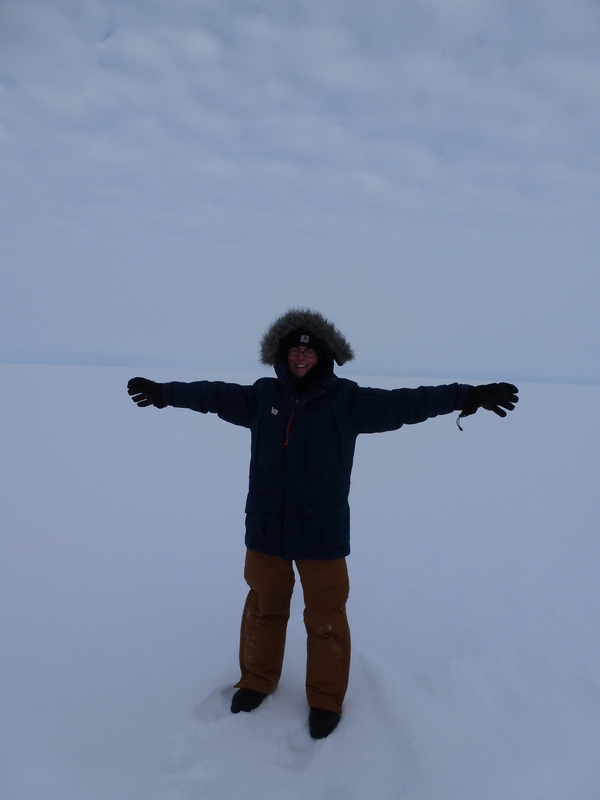 I’m looking forward to going home and seeing my husband and our dog, but I’ll miss the friends I’ve made on the ship and I’ll certainly miss collecting data. Even though it can be quite repetitive after awhile, I can’t think of a more beautiful place to do this work than the Gulf of Alaska. The last few days we have had a couple of stations near the coastline around Seward, Alaska and we have ventured into both Harris Bay and Resurrection Bay. 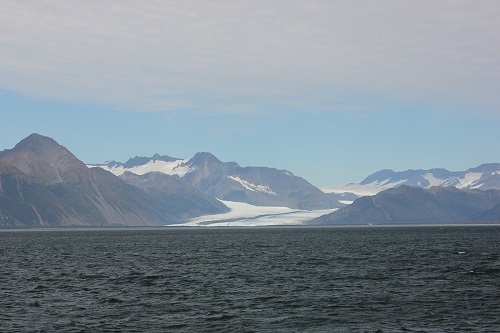 There we caught sight of some amazing glaciers and small islands. There was even an island that had bunkers from WWII on it. 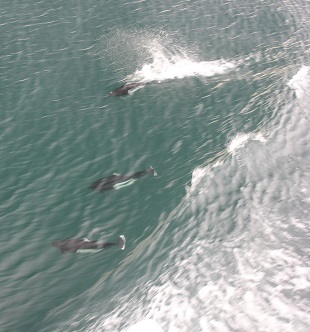 Yesterday, 3 Dall’s Porpoises played in our bow wake as I stood on the bridge and watched. It’s moments like this that all of the discomforts of being at sea fall away and I can reflect on what an incredible experience this has been! Beautiful scenery from Resurrection Bay. Three Dall’s porpoises that were playing in our bow wake. Spiny lumpsuckers are tiny, cute, almost spherical fish that have a suction disk on their ventral (bottom) side. The suction disk is actually a modified pelvic fin. They use the suction disk to stick to kelp or rocks on the bottom of the ocean. Their family name is Cyclopteridae (like the word Cyclops!). It is Greek in origin. “Kyklos” in Greek mean circle and “pteryx” means wing or fin. This name is in reference to the circle-shaped pectoral fins that are possessed by fish in this family. These lumpsuckers are well camouflaged from their predators and their suction disk helps them overcome their lack of an air bladder (this helps fish move up and down in the water). Because lumpsuckers don’t have an air bladder, they are not great swimmers. Spiny lumpsuckers are on average about 3 cm in length, but there are larger lumpsuckers that we have found, like the toad lumpsucker that you can see in the photo below. 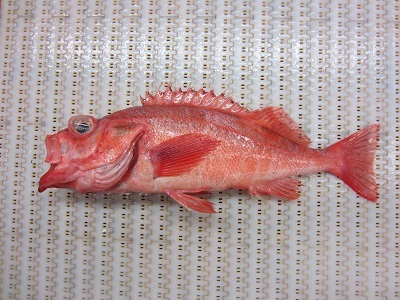 You can read more about the spiny lumpsucker on the Aquarium of the Pacific’s website. A cute little spiny lumpsucker. We have been seeing a lot of humpback whales lately on the cruise. Humpback whales can weigh anywhere from 25-40 tons, are up to 60 feet in length, and consume tiny crustaceans, plankton, and small fish. They can consume up to 3,000 pounds of these tiny creatures per day (Source: NOAA Fisheries). 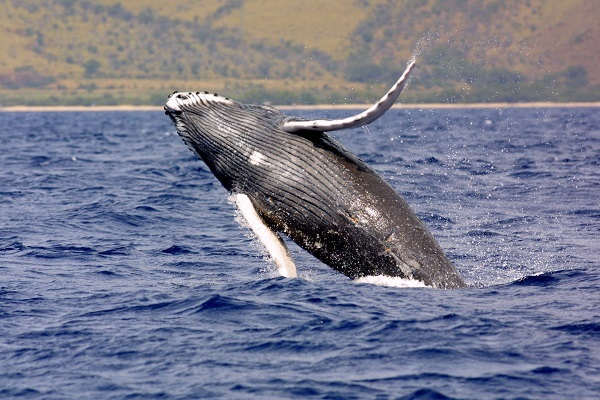 Humpback whales are filter feeders and they filter these small organisms through baleen. Baleen is made out of hard, flexible material and is rooted in the whale’s upper jaw. 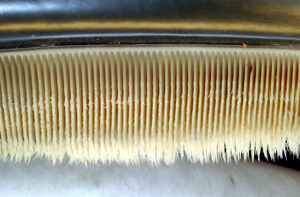 The baleen is like a comb and allows the whale to filter plankton and small fish out of the water. 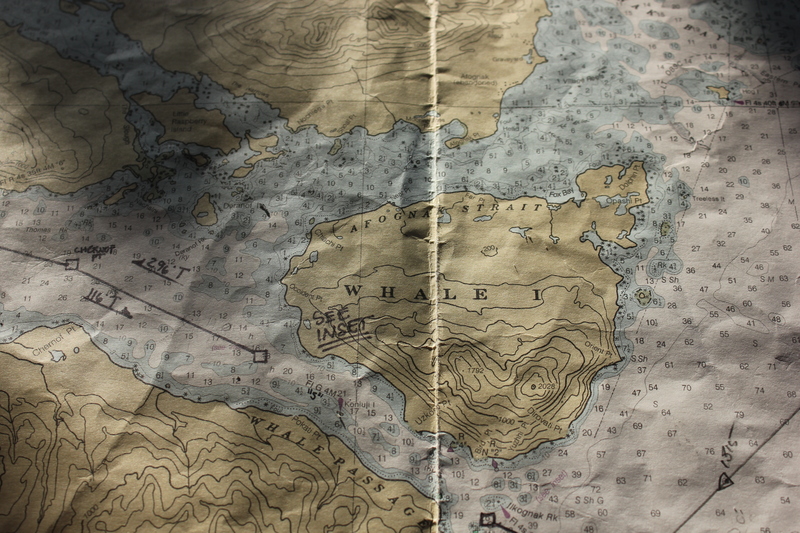 I’ve always wondered how whales can eat that much plankton! Three thousand pounds is a lot of plankton. I guess I felt that way because I had never seen plankton in real-life and I didn’t have a concept of how abundant plankton is in the ocean. Now that I’m exposed to zooplankton every day, I’m beginning to get a sense of the diversity and abundance of zooplantkon. 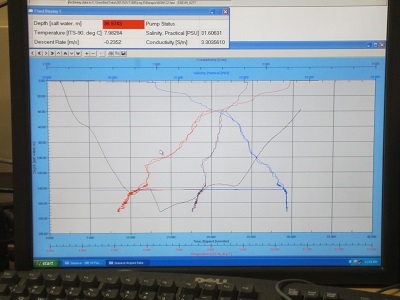 In my last blog entry I explained how we use the bongo nets to capture zooplankton. In this entry, I’ll describe some of the species that we find when clean out the codends of the net. As you will see, there are a wide variety of zooplankton and though the actual abundance of zooplankton will not be measured until later, it is interesting to see how much we capture with nets that have 20 cm and 60 cm mouths and are towed for only 5-10 minutes at each location. Whales have much larger mouths and feed for much longer than 10 minutes a day! Cleaning the codends is fairly simple; we spray them down with a saltwater hose in the wet lab and dump the contents through a sieve with the same mesh size as the bongo net where the codend was attached. The only time that this proves challenging is if there is a lot of algae, which clogs up the mesh and makes it hard to rinse the sample. Also, the crab larvae that we find tend to hook their little legs into the sieve and resist being washed out. 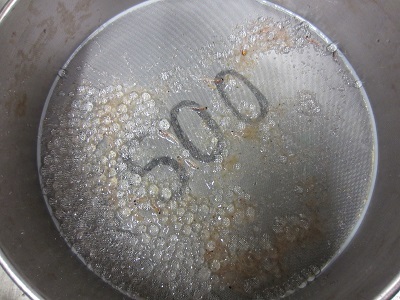 Below are two images of 500 micrometer sieves with zooplankton in them. 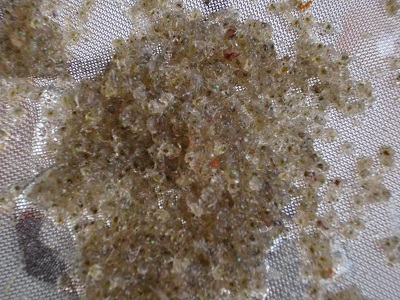 A mix of zooplankton that we emptied out of the codend from the bongo. Crab larvae (megalopae) that we emptied out of the codend. The other day we had a sieve full of ctenophores, which are sometimes known as comb jellies because they possess rows of cilia down their sides. The cilia are used to propel the ctenophores through the water. 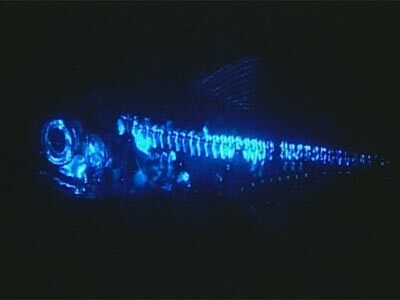 Some ctenophores are bioluminescent. Ctenophores are voracious predators, but lack stinging cells like jellyfish and corals. Instead they possess sticky cells that they use to trap predators (Source: UC Berkeley). 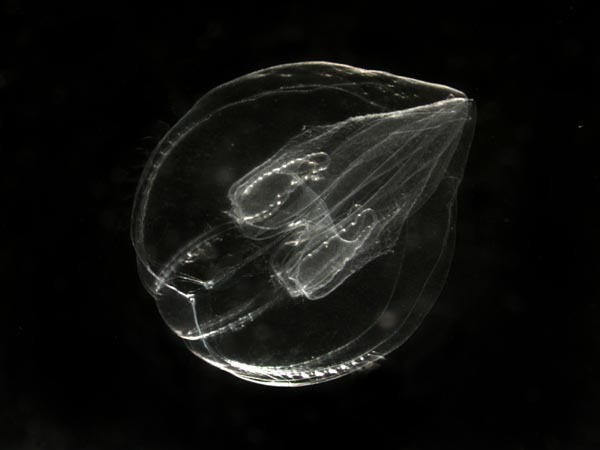 Below is a picture of our 500 micrometer sieve full of ctenophores and below that is a close-up photo of a ctenophore. A sieve full of ctenophores or comb jellies. 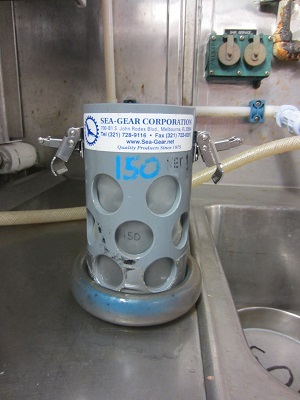 It’s fun to compare what we find in the bongo nets to the type of organisms we find in the trawl at the same station. We were curious about what some of the fish we were eating, so we dissected two of the Silver Salmon that we had found and in one of them, the stomach contents were entirely crab larvae! In another salmon that we dissected from a later haul, the stomach contents included a whole capelin fish. Juvenile pollock are indiscriminate zooplanktivores. That means that they will eat anything, but they prefer copepods and euphausiids, which have a high lipid (fat) content. Once the pollock get to be about 100 mm or greater in size, they switch from being zooplanktivores to being piscivorous. Piscivorous means “fish eater.” I was surprised to hear that pollock sometimes eat each other. Older pollock still eat zooplankton, but they are cannibalistic as well. Age one pollock will eat age zero pollock (those that haven’t had a first birthday yet), but the bigger threat to age zero pollock is the 2 year old and older cohorts of pollock. Age zeros will eat small pollock larvae if they can find them. Age zero pollock are also food for adult Pacific Cod and adult Arrowtooth Flounder. Older pollock, Pacific Cod, and Arrowtooth Flounder are the most voracious predators of age 0 pollock. Recently, in the Gulf of Alaska, Arrowtooth Flounder have increased in biomass (amount of biological material) and this has put a lot of pressure on the pollock population. Scientists are not yet sure why the biomass of Arrowtooth Flounder is increasing. (Source: Janet Duffy-Anderson – Chief Scientist aboard the Dyson and Alaska Fisheries Science Center). The magnified images below, which I found online, are the same or similar to some of the species of zooplankton we have been catching in our bongo nets. Click on the images for more details. I’m thankful that last night we had calm seas and I was able to get a full eight hours of sleep without feeling like I was going to be thrown from my bed. This morning we are headed toward the Kenai Peninsula, so I’m excited that we might get to see some amazing views of the Alaskan landscape. 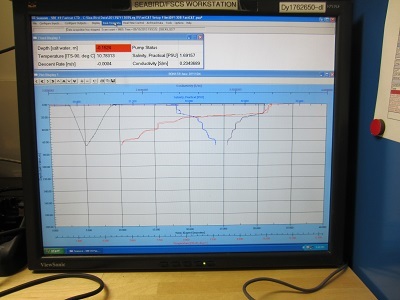 The weather looks like it will improve and the winds have died down to about 14 knots this morning. Last night’s shift caught an octopus in their trawl net; so hopefully, we will find something more interesting than just kelp and jellyfish in our trawls today. I mentioned that we had found some different types of pteropods in our bongo nets. Pteropods are a main food source for North Pacific juvenile salmon and are eaten by many marine organisms from krill to whales. There are two main varieties of pteropods; there are those with shells and those without. Pteropods are sometimes called sea butterflies. 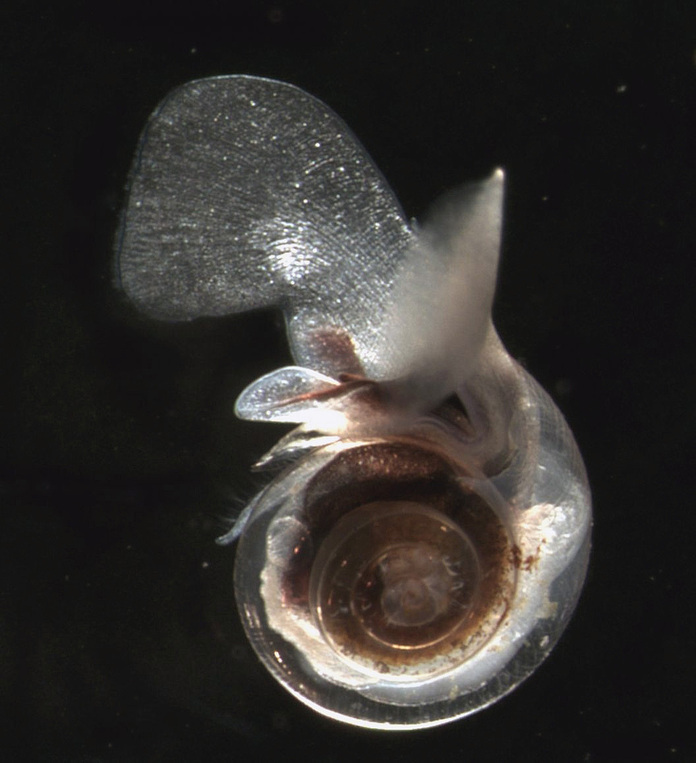 Unfortunately, shelled pteropods are very susceptible to ocean acidification. Scientists conducted an experiment in which they placed shelled pteropods in seawater with pH and carbonate levels that are projected for the year 2100. In the image below, you can see that the shell dissolved slowly after 45 days. If pteropods are at the bottom of the food chain, think of the implications of the loss of pteropods for the organisms that eat them! 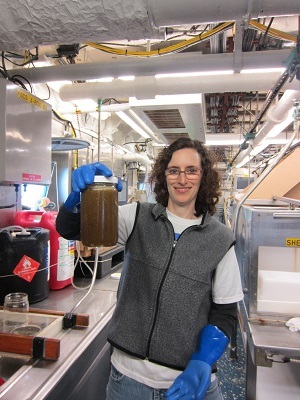 Read more about ocean acidification on the NOAA’s Pacific Marine Environmental Laboratory (PMEL) website. Also, check out this press release from November 2012 by the British Antarctic Survey about the first evidence of ocean acidification affecting marine life in the Southern Ocean. In my last blog entry on the bongo, I talked about using the “frying pan” or clinometer to measure wire angle. 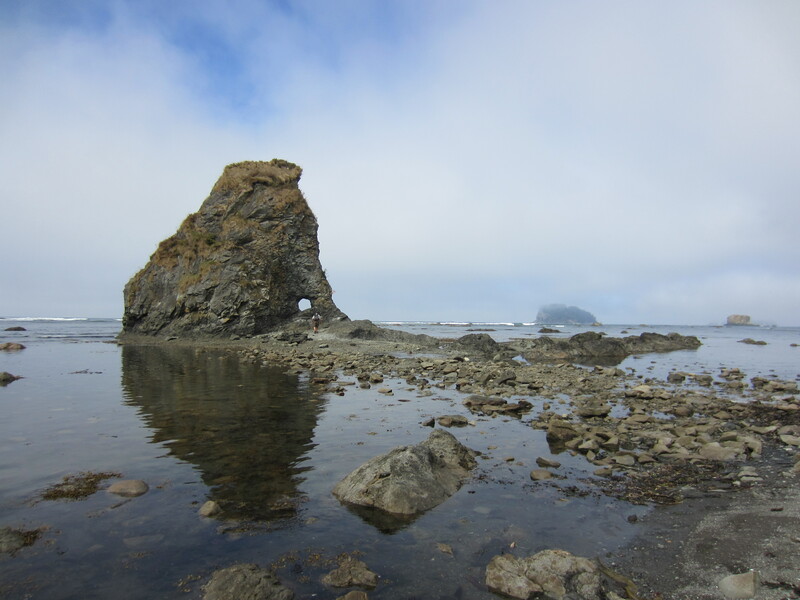 If you’re interested in other applications of clinometers, there are instructions for making homemade clinometers here and there’s also a lesson plan from National Ocean Services Education about geographic positioning and the use of clinometers this website. 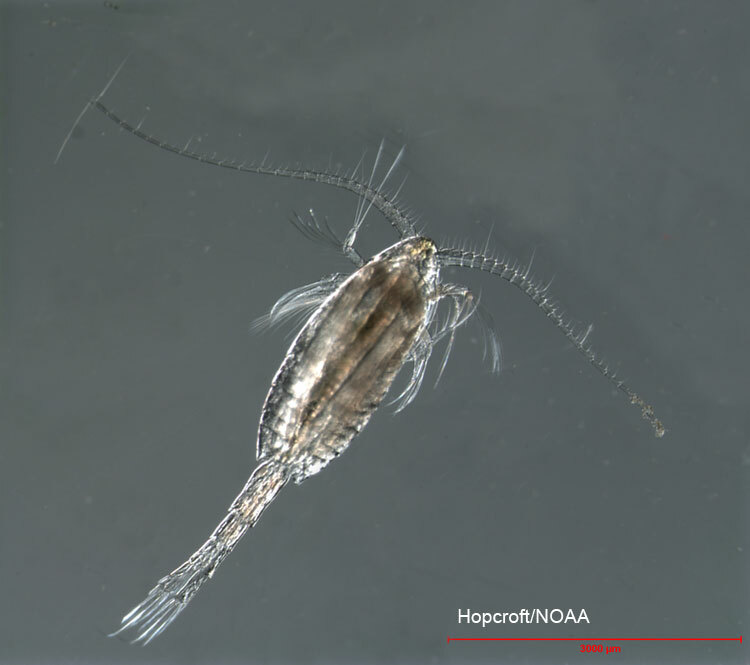 If you are interested in teaching your students about different types of plankton, here is a Plankton Wars lesson plan from NOAA and the Southeast Phytoplankton Monitoring Network, which helps students to understand how plankton stay afloat and how surface area plays a role in plankton survival. If you would like to show your students time series visualizations of phytoplankton and zooplankton, go to NOAA’s COPEPODite website. Zooplankton time series visualization from the COPEPODite website. For more plankton visualizations and data, check out NOAA’s National Marine Fisheries Service website. If you are interested in having your students learn more about ocean acidification, there is a great ocean acidification module developed for the NOAA Ocean Data Education Project on the Data in the Classroom website. My trip to Kodiak from Washington, DC was a long one. I left DC early in the morning on September 2nd and I nearly missed my connection in Seattle after our flight left late from Reagan National Airport. I tried to dash off the plane, lugging my suitcase and backpack, with only 10 minutes to get to my connecting flight before it was supposed to take off. Fortunately, I know my way around SEA-TAC airport and with all of my escalator running experience from a year of DC living, I was able to get to my gate with 2 minutes to spare. On the plane, I was reunited with the scientists for my cruise and off we flew to Anchorage. 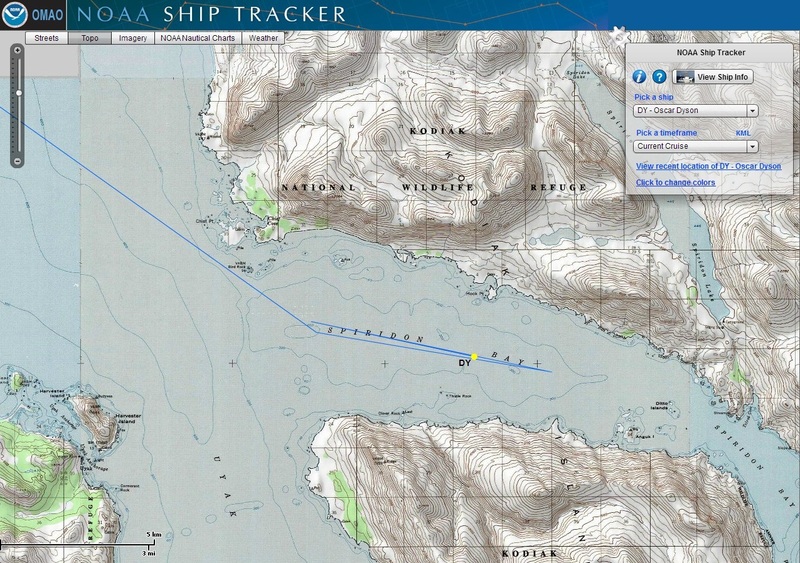 Three and a half hours later, we arrived in Anchorage and from there it was just a one-hour flight to Kodiak Island where the NOAA ship the Oscar Dyson was in port. While the ship was in port, we slept on board and I got used to the subtle rolls of the ship, which of course is nothing like when the ship is in motion. After a long day of travel on Monday, we ate dinner in town and went straight to bed afterwards. I spent the first day on the ship getting acquainted with the twists and turns of the hallways and the multiple staircases leading to different parts of the ship. Interestingly, you can’t walk from bow to aft on the same level on the Dyson, which makes it kind of difficult to get a nice deck side stroll. There are 8 people, including myself, on the science team and a total of 33 people aboard the ship. 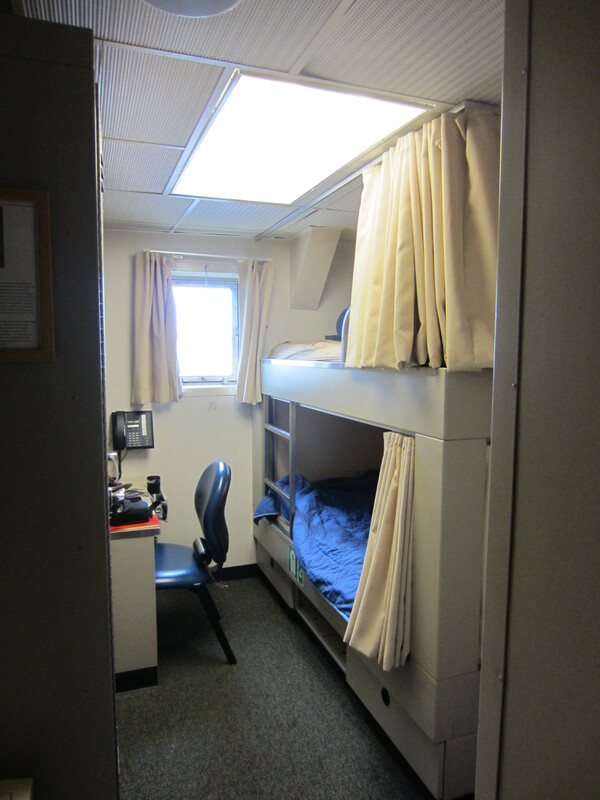 I’m sharing a cabin with one of the scientists and we each have our own bunk with a small lamp and a curtain so we can close ourselves in and get some shut-eye. 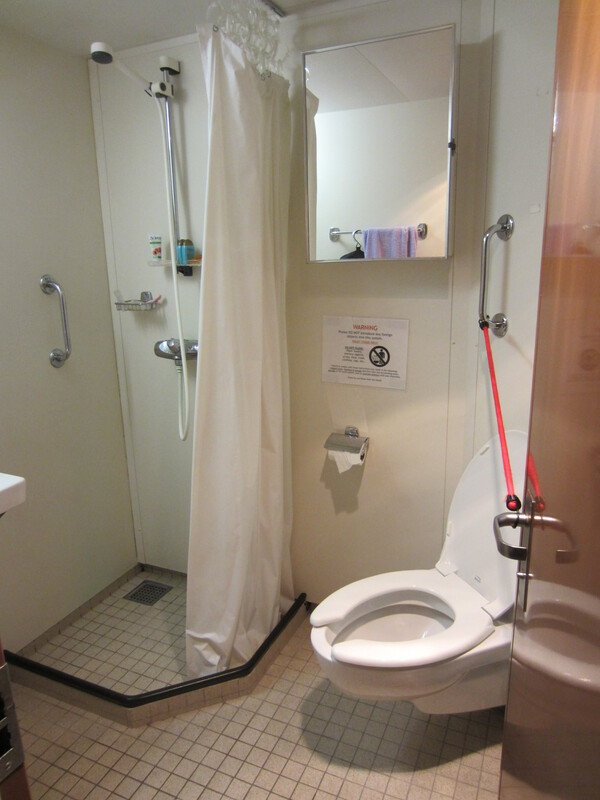 Each stateroom (cabin) has a shower and toilet, which is pretty luxurious! Once we get underway and get started working, I will work the noon to midnight shift and my roommate will work the midnight to noon shift. That way we will each have time alone in the cabin when the other is working. 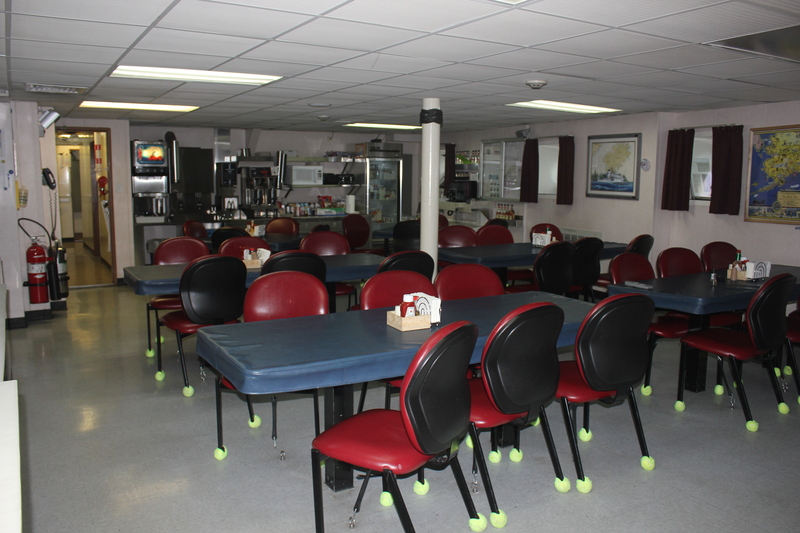 Mess Hall (cafeteria) on the Dyson. Note the tennis balls and the tie downs on the chairs. Tuesday was our first full day in Kodiak and we started the day aboard the Dyson with a briefing about the scientific work that we would be doing during the cruise. It was a bit overwhelming at first, because every term is completely new to me. But because of the repetitive nature of the work we will be doing, everyone has assured me that once we get going, I will totally get the hang of it. In short, one of the things we will be looking at is the year 0 pollock (those fish which haven’t had a first birthday yet). 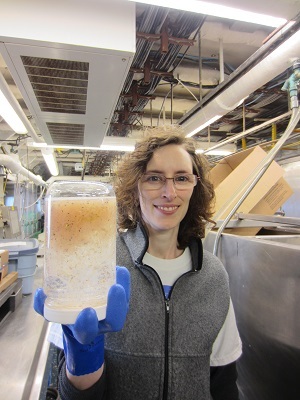 The fish we collect during the survey will be analyzed back in Seattle to see how healthy they are. From there, projections can be made about how many pollock will make it through the winter and survive until their first birthday. Fish become vulnerable to the fishing when they reach year 3, so it’s important to understand the health of the young pollock now to set the numbers that can be caught by the fishing boats down the road. Research boats are not like cruise ships. There are few comfortable places to sit outside of the lounge and people are working around the clock on various shifts, so you have to be really quiet when walking through the hallways. On board, there are automatically closing doors that slam shut during drills and emergencies, very steep staircases, and slippery floors. The Oscar Dyson has several labs below deck. 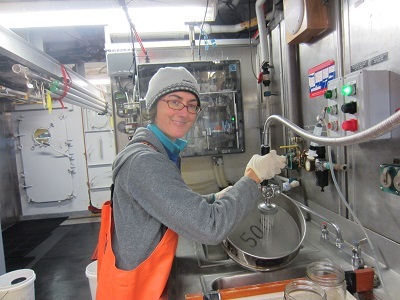 I will spend most of my time working in the wet lab processing the pollock that we collect. There are computers on board and we also have internet, though the ship has to be going the right direction for us to be able to use it because otherwise the incoming signal gets blocked by the exhaust stack when the ship is at certain headings. On Tuesday morning, we also had a short briefing about by Operations Officer Mark Frydrych, one of the NOAA Corps officers aboard the Dyson. He described the general rules and regulations on board the ship. 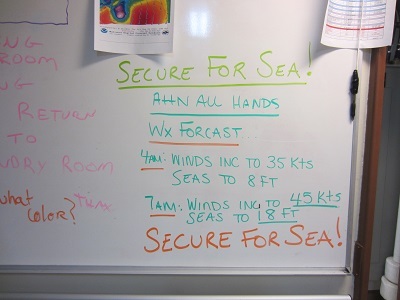 Tomorrow (Wednesday) we head out to sea in the afternoon after the ship gets fueled. We will have to travel for a few hours to get to our first station where the work begins. I’m really looking forward to getting out to sea and starting to work on the project! 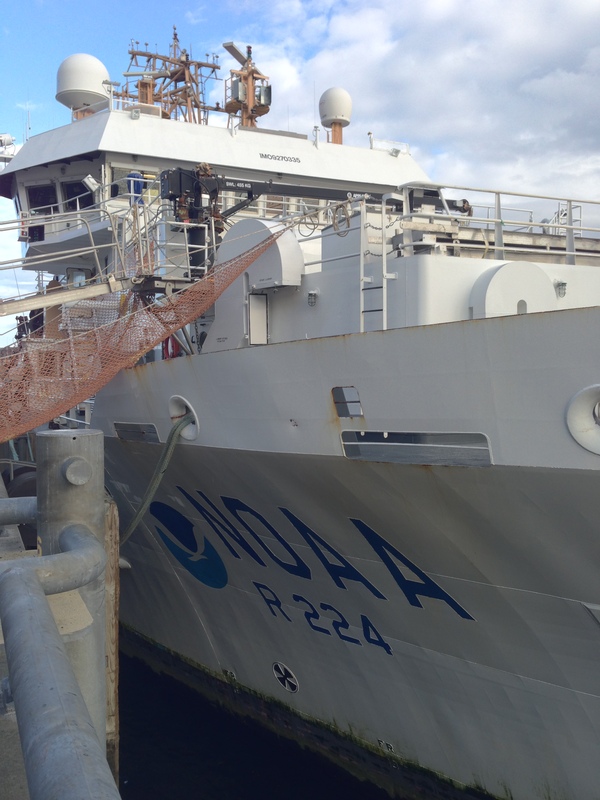 “NOAA Ship Oscar Dyson R-224 supports NOAA’s mission to protect, restore and manage the use of living marine, coastal, and ocean resources through ecosystem-based management. 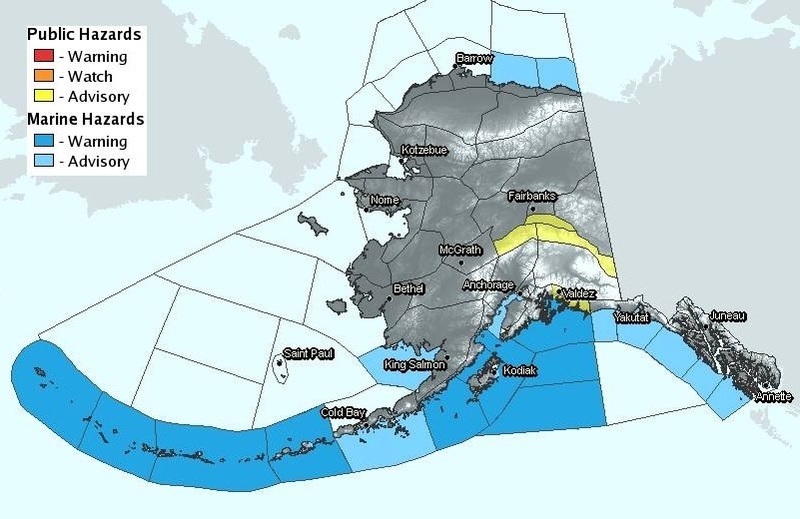 Its primary objective is as a support platform to study and monitor Alaskan pollock and other fisheries, as well as oceanography in the Bering Sea and Gulf of Alaska. 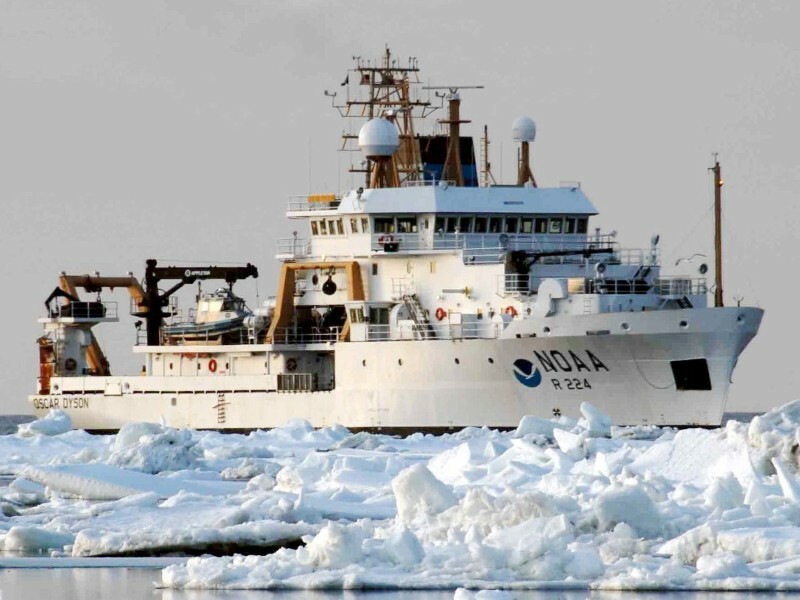 The ship also observes weather, sea state, and other environmental conditions, conducts habitat assessments, and surveys marine mammal and marine bird populations. My name is Britta Culbertsonand I am currently serving as anAlbert Einstein Distinguished Educator Fellow in Washington, DC. Prior to my fellowship, I was a high school science and art teacher in Seattle, Washington at The Center School. I am serving my fellowship in NOAA’s Office of Education and have spent the last year getting exposed to many aspects of NOAA’s education efforts. Einstein Fellows are K-12 science, technology, engineering, or math (STEM) educators who come from all over the United States after a competitive selection process to serve in federal agencies or on Capitol Hill. They typically serve for the duration of one school year. Fortunately, I was offered to stay one more year in my office and will complete my second year in July 2014. 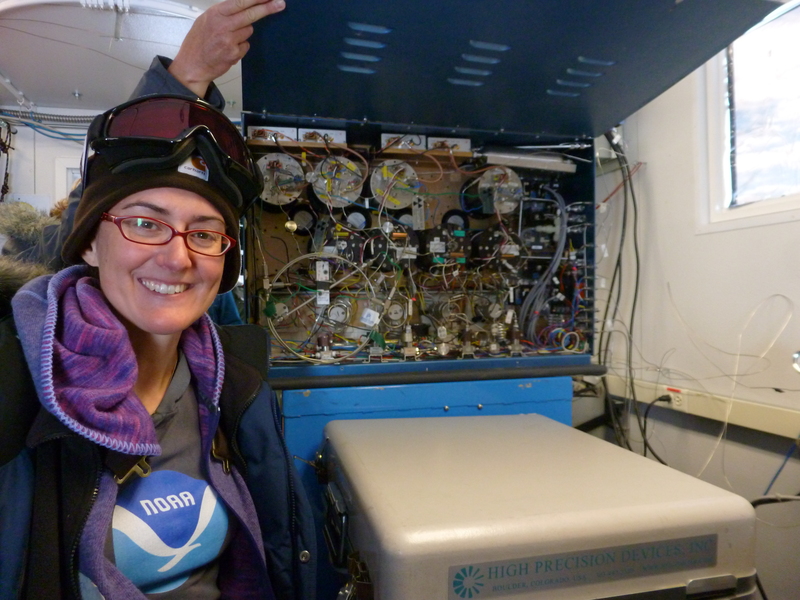 Through my role as an Einstein Fellow, I have been able share NOAA resources with teachers at national conferences, work on the education website, and network with a community of STEM professionals in Washington, D.C. among other things. One task that I hope to accomplish this year is figuring out a way to make real-time NOAA datasets more accessible to teachers. I am really excited about the opportunity to be a NOAA Teacher at Sea to learn more about the fisheries research conducted by NOAA scientists and to see if there might be opportunities to share real data from my cruise with students and their teachers. After spending a year meeting Teacher at Sea alumni and hearing about their experiences, I am overjoyed to embark on my own cruise and to have a chance to work with scientists in the field. I think these real-life experiences are crucial for teachers because it allows them get in touch with the scientific process in the field as opposed to the artificial environment in which we conduct experiments in the classroom. Sharing these real-life research experiences with students is vital to their understanding of science. 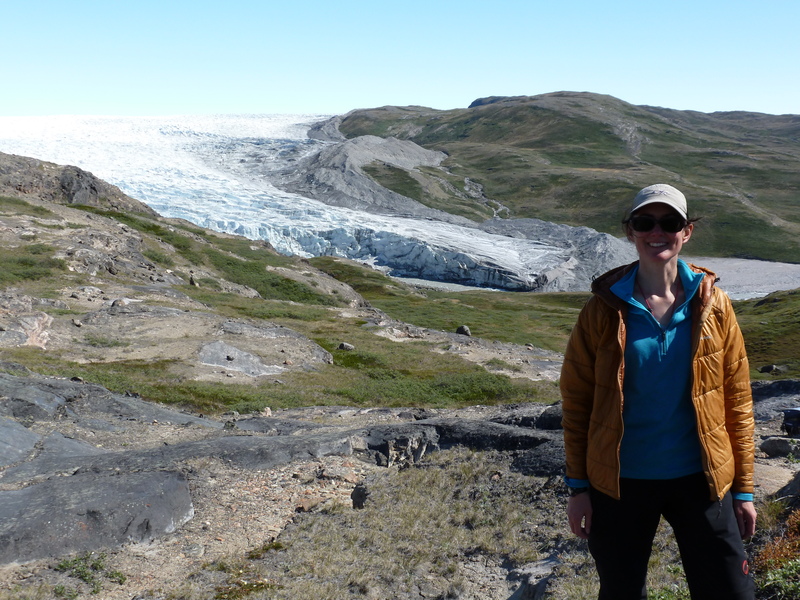 I spent part of my summer in Greenland working with high school students from Denmark, Greenland, and the United States. During my three weeks there, I was inspired by the way the students were more interested in the research they conducted. Being in the field made it more relevant and the students were more engaged. We had visual teleconferences with scientists who were studying climate change and also worked with scientists who were in Greenland conducting research. It was such a phenomenal experience for everyone involved. I wish to use this trip as a model for my future classroom experiences and I am hoping that some of the scientists on my cruise might be willing to stay in touch with me and my students in the future. Not only do I wish to incorporate more “real world” experiences and data into my science teaching, but I hope to connect more students with scientists. Our cruise has several objectives ranging from the study of walleye pollock to physical and chemical oceanography. I’m also excited about one aspect of the cruise, which is a gear comparison to examine the catch differences for each species between the anchovy trawl and the CamTrawl. We will also be describing the community structure, biomass, and vitality of the other swimming, aquatic organisms we capture along with pollock. These organisms include capelin, eulachon, Pacific cod, arrowtooth flounder, sablefish, and rockfish. Additionally, we will examine species that typically prey upon pollock and we will measure the environmental variables that could affect pollock ecology. 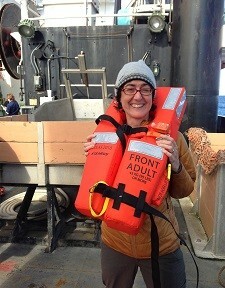 It was a wonderful coincidence that I happened to be in Washington State visiting the Olympic Coast National Marine Sanctuary (OCNMS) the NOAA Alaska Fisheries Science Center when the science team for my cruise had their pre-cruise meeting. I was able to attend in person and meet the scientists with whom I will spend the next three weeks. I am really looking forward to working with them! Visiting the OCNMS was a special treat before my upcoming cruise. 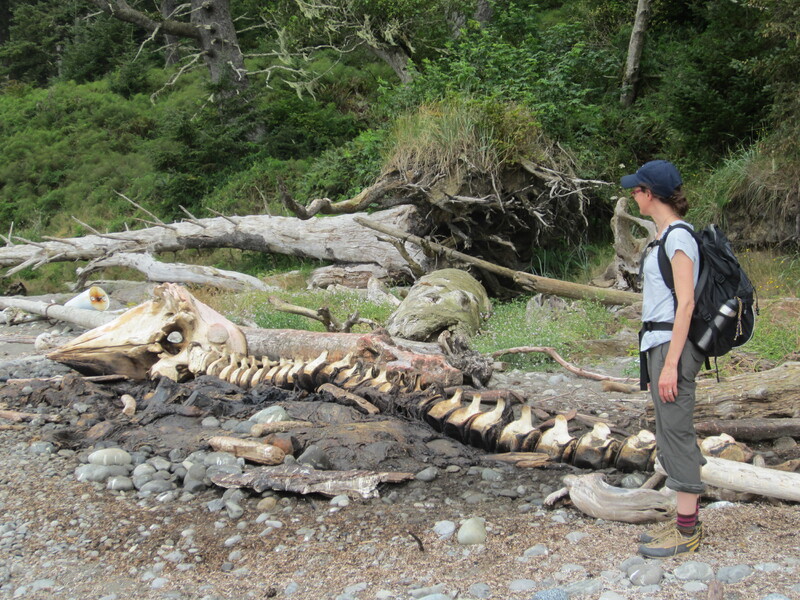 It was pretty awesome to stand along the Olympic Coast and check out all of the tide pools and other things like the huge whale skeleton I found. In a few days instead of being on the edge of this massive ocean, I’ll be on a boat discovering what is in the depths of the same ocean. I’m looking forward to leaving the hot and humid D.C. weather behind for the cooler weather in Kodiak. 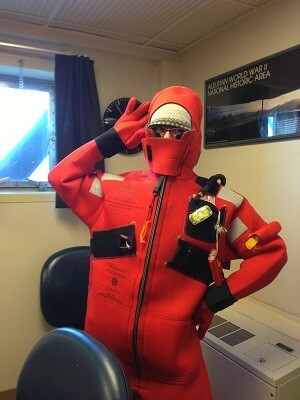 Next time you hear from me, I’ll be a teacher at sea!